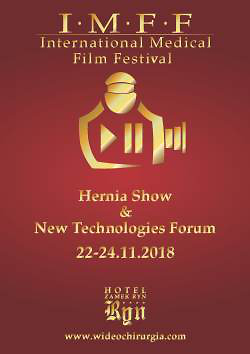 Gierej P, Kotulski M, Piotrowicz S, M. Wróblewski T. Adhesive complications in a patient after ventral hernia IPOM repair – a case report for Videoforum. Videosurgery and Other Miniinvasive Techniques. 2010;5(4):166-170. doi:10.5114/wiitm.2010.18832. Gierej, Piotr, Marcin Kotulski, Sebastian Piotrowicz, and Tadeusz M. Wróblewski. 2010. "Adhesive complications in a patient after ventral hernia IPOM repair – a case report for Videoforum". Videosurgery and Other Miniinvasive Techniques 5 (4): 166-170. doi:10.5114/wiitm.2010.18832. Gierej, Piotr et al. "Adhesive complications in a patient after ventral hernia IPOM repair – a case report for Videoforum." Videosurgery and Other Miniinvasive Techniques, vol. 5, no. 4, 2010, pp. 166-170. doi:10.5114/wiitm.2010.18832. We present two similar case reports of patients who, due to formation of adhesions, were reoperated on following IPOM procedures. The first case is a 21-year-old woman after primary operation: WTP fundoplication and IPOM ventral (linea alba) hernia repair. Chronic pain was the reason for two second-look laparoscopies. There were massive adhesions between the Dynamesh® and the greater omentum as well as the left lobe of the liver. The second case was a male patient after the same primary procedure, reoperated on because of pain and recurrent subileus caused by adhesions between the Dynamesh® and the stomach. Although laparoscopic IPOM hernia repairs are nowadays becoming very popular, one should remember their disadvantages and limitations: anti-adhesive properties of IPOM meshes can still be insufficient in some cases in the long term; further studies and technical progress are needed.